Since my first smart phone till date, I've always invest in one way or another a type of car mounting system for my mobile device. And most solutions just die on me within about six to nine months. So far this mount have stayed usable since I got it in December 2014. That makes it 1.5 years old. That's why I have decided to do a small write up about it. Prior to using the iOTTie Easy One Touch 2 mount (that is a very long name to say ... to type! ), lets just call it the iEOT2. I had just upgraded the OnePlus One (no blog post) from my Samsung Galaxy S3. And I know the existing case & mount's wont work anymore. And when I saw the iEOT2. I knew that it would be my next mobile phone car mount. It retails for about USD$29.95. When others here are buying cheap mounts costing less than RM 20.00 I was spending extra RM 50 or so for the car mount. Most mounting solutions will either use the air conditioning vents, CD slot, and most commonly stuck to the glass. I didn't particularly fancy all those option. My air conditioning vents wasn't in good condition and doesn't really stay in place. My car does not have a CD / DVD player, I'm old school like that =P. And this mount claims that it's able to mount on ANY surface. I like this box design. I guess it's meant for retail buyers where you can actually try out the one touch locking mechanism without taking it out of the box. Like a toy. Unfortunately for me I didn't get a hands on as I purchased it online. Glad the experience was okay. Sticky suction pad - this thing is like glue. Really sticky glue. Once you press it down onto the textured surface, it will basically seal up all the holes and cracks creating vacuum when you lock it down. Two stage locking - for surfaces which has more texture, you can create more vacuum by locking it into stage two on the lever. That would create even more serious vacuum inside the sealed area created by the sticky suction pad. For the most part, the mount and phone was locked in place pretty tightly. It fell few times of because I had used the extender and was driving thru bumpy Kuching roads. Do note that this mount was designed for phones with screen size of less than 5" and probably less than 150gm of weight (I'm assuming here). My OnePlus One was 5.5" at about 162g. As you can see from the picture above, it could still clamp onto my phone with case. Maybe due to our tropical weather, and I never remove the mount since day one of putting it on and the fact that my car is never parked in shaded area during the day the sticky pad is, melting. As you can see from the picture above. The situation got a bit crazy when it started to melt the sticky bits down the side of my dash board. A close up of the sticky suction pad after washing. So I would consider this "WEAR AND TEAR". But what I found interesting was that when using level two suction over extended period of time, it has caused a mark on my dash board. 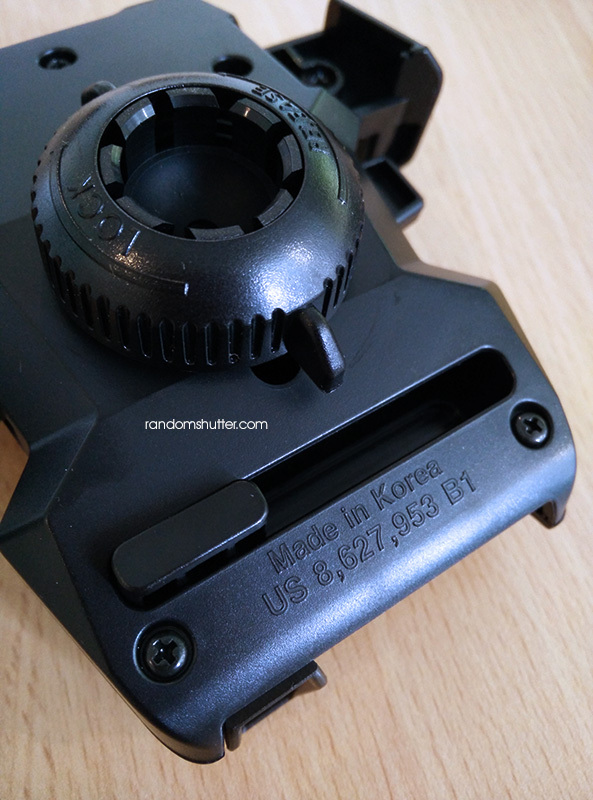 When I removed the mount, and cleaned up the sticky goo, I found a deep ring at the mount position. Just goes to show, how much holding power it had over the 1.5 years of usage. cant really see it, but after few minutes the grooves got lighter, but its still there. Indented. While writing up this blog post, I just found out that iOttie has a new mount out, called One Touch 3 car mount. Surprise! It looks good. Will I buy it, probably YES if I can find it at a discounted price. With our ringgit not as strong, USD$ 29.95 is a lot of money for a mobile phone car mount. I'll still keep using the current iEOT2 till it breaks apart.